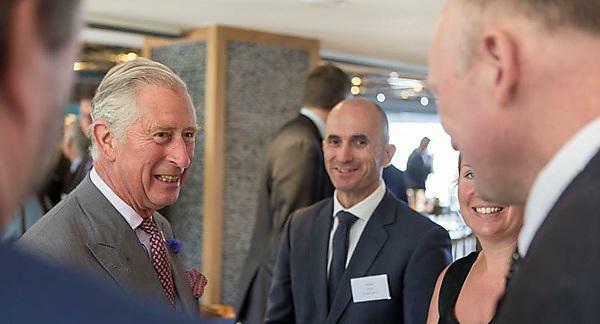 Academics from Plymouth University were among those meeting the Prince of Wales and Duchess of Cornwall during an event to raise awareness of the problem of marine litter. Professor of Marine Biology Richard Thompson and Dr Gregory Borne, Director of the University’s Sustainability and Surfing Research Group, shared experiences and ideas of how to reduce the amount of litter on our coastlines. The royal visit was part of an Ocean Plastics Awareness Day organised by Surfers Against Sewage, the Marine Conservation Society and Clean Cornwall on Fistral Beach, Newquay. It gave NGOs, local and national government, academia and industry an opportunity to commit to exploring and delivering pilot schemes to prevent the flow of plastics to local beaches and reuse plastic waste removed by local cleansing activities. It also saw the launch of a Statement of Intent signed by participating NGOs, local government, academia and businesses to explore, develop and deliver innovative circular economy pilot projects. Plymouth University, its Sustainability and Surfing Research Centre and the Marine Institute are among those to have already signed up. During the event, their Royal Highnesses saw first-hand how community action in the county is bringing thousands of people together to help combat the menace of marine plastic litter. Surfers Against Sewage, the Marine Conservation Society and Clean Cornwall have collectively enlisted the support of well over 30,000 people to clean up beaches around the UK in the past year. HRH The Prince of Wales has long taken an interest in the health of the marine environment and the need to address waste. The Prince of Wales’s International Sustainability Unit has attempted to integrate conversations on marine plastic waste with those focusing on the circular economy at a global level, and the activities in Cornwall showcase what can be done to address waste locally. There are already some great examples of recycling and recovery projects in Cornwall that contribute to the circular economy, such as the Kimo Fishing for Litter scheme, fishing net recycling projects and the Finisterre bottles to clothing initiative. Used as models of best practice, these and other schemes, showcased on Ocean Plastics Awareness Day, could then be rolled out in other parts of the country. Prince Charles spoke to me with passion about his concern for the levels of plastic waste in our oceans, asking how it can be allowed to happen in the first instance.